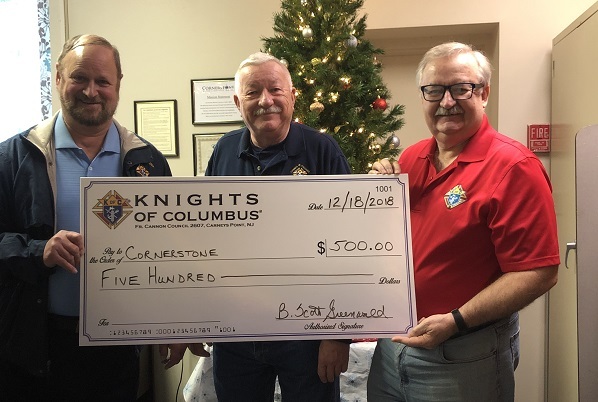 For over 130 years, the Knights of Columbus has supported men, families, and the Catholic Church through charitable service. Here are just a few of the good works the Knights have done recently, throughout the Diocese of Camden. Archangel Council 7429, Berlin: The fourth annual Pasta Dinner was held last February at Our Lady of Mount Carmel School, and raised over $6,000 for the local Saint Vincent de Paul Society. 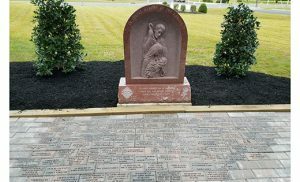 Holy Crusaders Council 9193, Blackwood: Obtained and installed a Pro-Life Memorial for the Unborn, which was dedicated last October in front of Saint Agnes Church, Our Lady of Hope Parish. 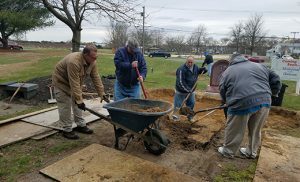 Councils 7032 and 6247, together with the Pro-Life Ministry of Mary, Mother of Mercy Parish, Glassboro, have been working on building a Memorial to the Unborn on the grounds of Our Lady of Lourdes Church in Glassboro. Liberty Council 1910, Bridgeton: Collaborated with the Parish of the Holy Cross’ Altar & Rosary Society on a diaper and baby wipe drive for new mothers at Good Counsel Homes, a residence and refuge for women and their children. Father Cannon Council 2607, Carneys Point: Presented a check for $500 last December to the Cornerstone Women’s Resource Center in Salem. Saint John Neumann Council 7032, Glassboro: With Council 6247, set up the church hall at Mary, Mother of Mercy Parish, and bought and prepared the food for a “Fat Tuesday Breakfast for Dinner” for faith formation students. Saint Vincent Pallotti Council 3471, Hammonton: Organized busses to the March for Life in D.C. last January for Saint Joseph High School students. Monsignor Zegers Council 9113, Marmora: Their annual Feed the Needy Program partners with Toys for Tots to aid 400 families in the region. 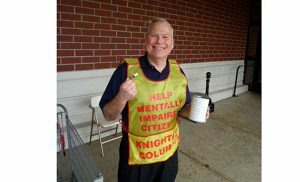 During its regular Tootsie Roll drive, Cherry Hill Council 6173, Knights hand out Tootsie Rolls to people who donate money for Camp Sun ‘N Fun, a place that caters to the mentally challenged. The council raises about $3,000 per year with that drive. Saint Peter’s Parish Council 6735, Merchantville: Last December, 30 Knights and church staff helped erect Christmas trees on parish grounds, a signature event for faithful. Holy Name of Jesus Council 12503, Mullica Hill: Their annual coin drop resulted in three $1,000 scholarships, presented to students at three local schools. Immaculate Conception Council 3512, Pennsauken: Three Knights were recently recognized with lifetime achievement awards for a combined 125 years of service: Bob Maronski, who joined in 1961; Al Munda, in 1983; and Larry Painter, in 1987. A dedication for the Memorial to the Unborn on the grounds of Our Lady of Lourdes Church is being planned for June. Holy Child Council 3532, Runnemede: A beef and beer fundraiser raised a total of $5,000 for the Larc School, a special education school in Bellmawr which serves students with moderate to severe disabilities. Sancta Familia Council 11498, Washington Township: A Red Cross Blood Drive was held at Church of the Holy Family, sponsored by the Knights, which raised over 41 units of blood to save lives.